Sometimes Apple comes up with a product that is so well designed you wonder why it didn't happen sooner. Such is the case with the iMac G5, which was introduced six years ago. Where the G3 iMacs had been bulky, built around traditional CRT technology, and the G4 iMacs had been a design statement with their hemisphere base and floating flat panel display, the G5 iMac hid the entire computer behind the display, resulting in a machine just 6.8" deep (or 7.4", in the case of the 20" iMac). It's a funny thing, but for some reason a lot of computer users think the computer is built into the monitor, not that big beige box on the floor. They refer to that as their hard drive, as though its only function is to hold the hard drive, optical drive, and ports. If you don't believe this is the case, hold a garage sale, put out some monitors, and see how many people ask about these "computers". One of the things Apple got right with the first Macintosh was putting the whole computer - disk drive, memory, CPU, 9" monitor, and ports - in a single unit. There was no separation of computer and display. Apple continued to use this configuration from 1984 into the early 1990s, when it gave way to Macs with larger (14") built-in displays, such as the 500 Series of LCs and Performas that found their way into schools and homes. One of them (right) even had a built-in TV tuner. 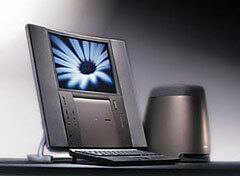 Apple's all-in-one designs grew larger with the 5000 Series, which had a 15" built-in display and stereo speakers. 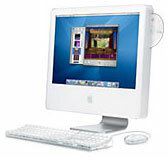 This design culminated with the gargantuan Power Mac G3 All-in-One in 1998, a model that weighed nearly 60 lb. Compare that with the original iMac, also from 1998, which also had a 15" monitor, a hard drive, a CD-ROM drive, and a G3 CPU, yet it weighed under 40 lb. It also looked a lot friendlier and less imposing than the G3 All-in-One. In 1999, Apple made the iMac a bit smaller and lighter, trimming its weight to under 35 lb. 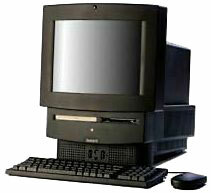 Along the way, Apple had developed its first desktop computer with a built-in LCD monitor, the 20th Anniversary Macintosh (right). Released in 1997 to celebrate Apple's 20th anniversary, the TAM was slim and futuristic. It even made an appearance in one of the Batman movies. The iMac G5 took everything essential about the iMac and built it into a slab. The display faced the front, the optical drive was on the side, and everything else was behind the display. The design evolved over time - adding a webcam in late 2005, adding a 24" version in late 2006, moving to an even thinner aluminum enclosure in 2007, and adopting today's 16:9 displays in late 2009. Over the years, a handful of PCs have copied the iMac design, yet the PC world is mostly full of black, silver, and beige "hard drive" boxes that users tend to forget about until they need to bend down and insert an optical disc or USB device. With the G5 iMac, Apple got things just right. The optical drive and USB ports are right there with the monitor, and it's a design we can expect Apple to stick with as long as there are desktop PCs.